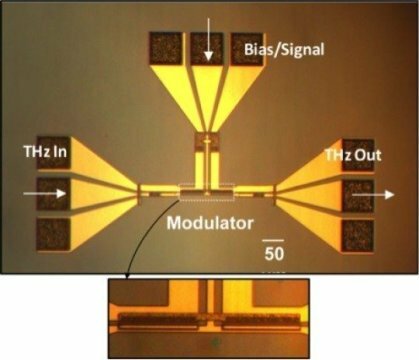 Tufts University engineers have invented a chip-sized, high-speed modulator that operates at terahertz (THz) frequencies and at room temperature at low voltages without consuming DC power. The discovery could help fill the "THz gap" that is limiting development of new and more powerful wireless devices that could transmit data at significantly higher speeds than currently possible. Measurements show the modulation cutoff frequency of the new device exceeded 14 gigahertz and has the potential to work above 1 THz, according to a paper published online in Scientific Reports. By contrast, cellular networks occupy bands that are much lower on the spectrum where the amount of data that can be transmitted is limited. The device works through the interaction of confined THz waves in a novel slot waveguide with tunable, two-dimensional electron gas. The prototype device operated within the frequency band of 0.22-0.325 THz, which was chosen because it corresponded to available experimental facilities. The researchers say the device would work within other bands as well. Although there is significant interest in using the THz band of the electromagnetic spectrum, which would enable the wireless transmission of data at speeds significantly faster than conventional technology, the band has been underutilized in part because of a lack of compact, on-chip components, such as modulators, transmitters, and receivers. "This is a very promising device that can operate at terahertz frequencies, is miniaturized using mainstream semiconductor foundry, and is in the same form factor as current communication devices. It's only one building block, but it could help to start filling the THz gap," said Sameer Sonkusale, Ph.D., of Nano Lab, Department of Electrical and Computer Engineering, Tufts University, and the paper's corresponding author.